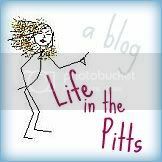 Life in the Pitts: I'm Famous! Lanie interviewed me! I've never been interviewed for a blog before. It was really fun. You're probably wondering if you can interview me for your blog now. The answer is YES. I love Lanie J. For a few reasons. First, we have the same same. So basically we are the same person. Second, she is very supportive. She always has nice things to say. And Third, she is super creative! So after you head over there and read my interview, take a few minutes to look around. You'll like what you see. And in other news, I tweeted over ten times yesterday. Stop pretending. You know you're impressed. now i can say that i am friends with someone famous!! now i can say i read your blog before you got a big head! Congratulations! That is so awesome :-) I'm heading over to read your interview now. Hopefully you wont get stalkers as a result of your being famous... unless you want stalkers. I won't judge. oh lanie...i've missed you too!!! i was just actually creeping your blog about an hour ago..... but i wanted to come back and creep much more thoroughly before i left any comments...so know this ~ i have intentions of coming back to thoroughly creep!